The head of an elite group of universities has called for maintenance grants to be restored to help improve diversity in higher education. Tim Bradshaw, who leads the Russell Group, told the Independent the grant could make a "substantial difference" to young people "nervous" about debt. He said it could also encourage more people to consider applying at all. The government says it has made significant progress in getting disadvantaged students into university. Does it matter which university you go to? Maintenance grants used to be given to students in England from lower income backgrounds - families with annual incomes of £25,000 or less got the full grant of £3,387 a year. In 2015, the then-Chancellor George Osborne announced they would be scrapped from September 2016. He said the grants had become "unaffordable" and there was a "basic unfairness in asking taxpayers to fund grants for people who are likely to earn a lot more than them". But critics said many low and middle income students could be put off university by the measure. In Wales, a new system of maintenance grants is being introduced from September. All Welsh students will get a £1,000 maintenance grant no matter where they study in the UK. On top of that, a mean tested element means the poorest students will get up to £8,100 ( and more if the study in London). The Russell Group - a collection of 24 prestigious "research-intensive" universities including Oxford and Cambridge - has been criticised for failing to attract enough students from ethnic minority and less privileged backgrounds. But Mr Bradshaw said the government should make more funding available to help improve access to higher education, instead of "putting all the blame on universities". Their options include a "living wage" for students who had been eligible for school meals during their school years. The £8,192 grant would reduce the debt of a student by £27,800, according to the proposal. Mr Bradshaw said: "It could be very targeted, really cost-effective and actually make quite a substantial difference to those from disadvantaged backgrounds who may inherently be very nervous about taking on an additional loan." A Department for Education spokesman said poorer undergraduates will get more help than ever when they go to university in the autumn. He said: "Finance should never be a barrier to a young person's education, and we are seeing real progress, with disadvantaged 18-year-olds 50% more likely to enter full-time university in 2017 compared with 2009. "We have increased the maximum grants and loans available to support students with costs, and disadvantaged students starting their courses this year will have access to the largest ever amounts of cash-in-hand support for their living costs." 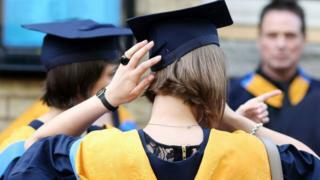 The spokesman also said the department was working with the national regulator for higher education in England - the Office for Students - to encourage more young people from disadvantaged groups to apply to university and give them support when there.